Will Nissan enter the 3/4 and 1 ton pickup market? Nissan has made some announcements over the past few months that hint at the possibility of a heavy-duty pickup for their lineup, one that might give the Detroit 3 some competition in the commercial and consumer towing sectors. Last month, Nissan announced that they would be putting a new and massive V8 Cummins diesel engine in the full-sized Titan pickup truck. This was an amazing announcement for those of us watching the industry simply because that V8 turbodiesel engine is vastly overpowered for a mere half ton truck. Unless, of course, it's a test market for something else. A heavy-duty offering, perhaps? Nissan has hinted this year that the Titan may not be their only full-sized pickup truck offering for long. With the influx of commercial vehicles, including the NV200, NV2500 and NV3000 vans, it seems that the company may be poised to enter the heavy-duty pickup truck market as well. And it would make sense, given their position. Unlike Toyota, Nissan doesn't yet suffer from under-capacity issues with their truck platforms. Toyota builds both its Tacoma and Tundra trucks at its Texas plant, but has few other options for spreading the load should they expand those and require a production increase. Nissan, on the other hand, builds the Titan in Mississippi and has growth potential for increased capacity at that facility as well as its facility in Mexico, which is where most of the commercial trucks built by Ram, Chevrolet and Ford are made. The new diesel offering for the Titan (read about it here) puts out a massive 550 lb-ft of torque. While a half-ton pickup frame can handle that, it provides far more towing and carrying capacity than the Titan itself is capable of. It would be over-powered were it in any of the 1500-level trucks on the market, so it makes little sense to offer it. Unless it's meant to appeal to consumers and give the impression that the Titan (and by inference, Nissan) is capable of a lot more than its current limited portion of the market indicates. In that case, the next obvious step is to go heavy-duty. 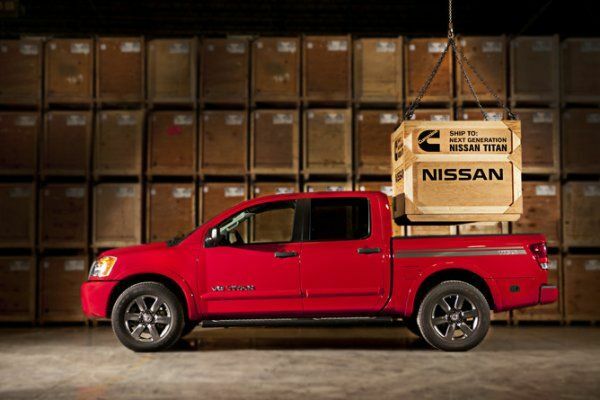 Nissan is no stranger to heavy, commercial vehicles. Their half, three-quarter and one-ton NV vans are testament to that and are selling well in the markets they've penetrated so far. With their introduction in the U.S., we can expect to see them giving Dodge and others some competition here as well. Adding in a heavy-duty diesel pickup starts to look like an obvious step towards that goal. We've reached out to Nissan for comments on this and will update when we hear from them. Update 9/22/2013: Steve Parrett at Nissan responded via email with a quick note to answer my question about whether Nissan plans to create a new model for the 3/4 and/or 1-ton pickup truck market. "To answer your question, I’ve not heard anything of that nature. Basically, we’re hitting that spot between the ½ and ¾ ton [with the Titan Diesel]." Steve offered to interview sometime this week, so there will be further follow up soon.